I’ve always wanted to try making a herbal sun tea. A glass of ice tea is perfect refreshment on hot, summer days. There are cold brew teas out there, but it’s so easy (and better!) to put one together at home. In just a few hours you’ll have a big batch you can put it in the fridge for the whole week. For this tea I used a 1:1:1 ratio of Rooibos (Red Bush Tea), rose tea and culinary lavender. To sweeten it, I used infused hibiscus honey. Rooibos (pronounced ROY-boss) is also called African Red Bush Tea. Grown only in South Africa, the tea is made from the needle-like leaves of the shrub, which turn red as the tea oxidizes, or ferments. Rooibos is naturally caffeine-free and full of antioxidants and minerals such as calcium and zinc. 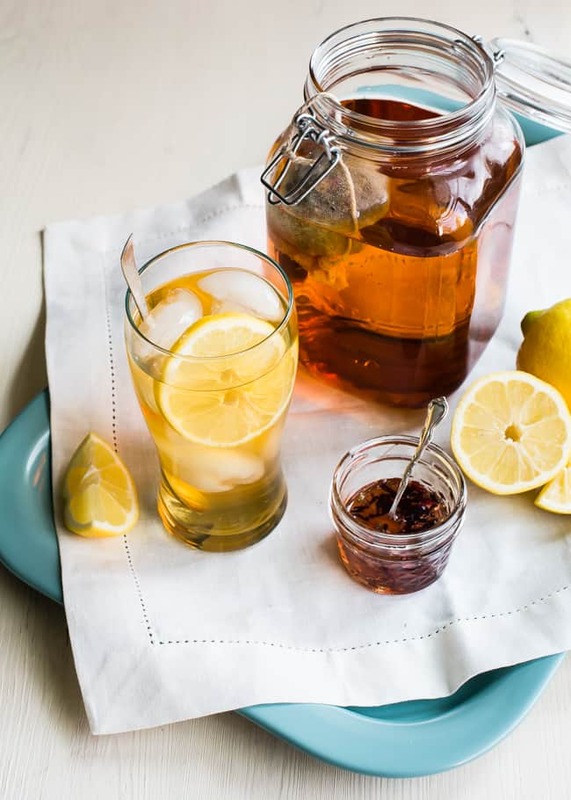 The lovely Red Tea, as it is also called, seems to benefit the digestive system and can help with skin conditions due to its high levels of phenylpyretic acid, which has anti-inflammatory properties. 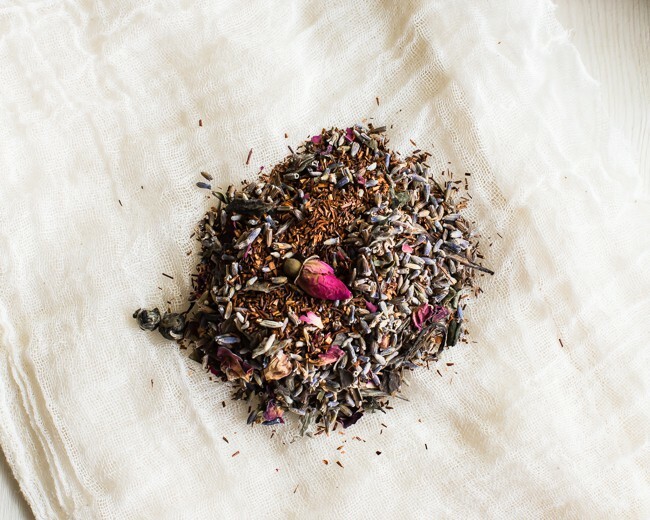 To make the tea, place the herbal tea blend onto several layers of cheesecloth and tie it into a pouch. Leave the string long enough so it’s easy to fish out after it’s “brewed.” Making a little pouch out of cheesecloth isn’t totally necessary, but it eliminates the step of straining the tea before you drink it. 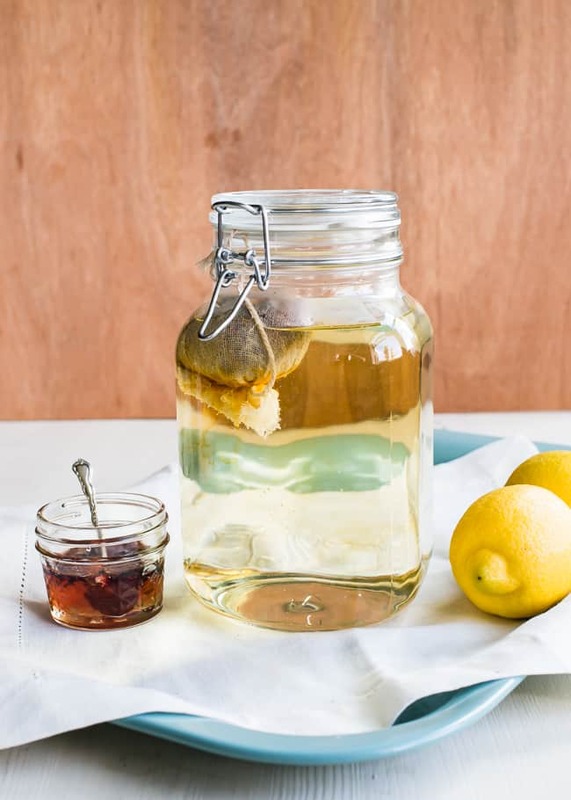 Then place the tea sachet into a large jar and fill it with cool or room temperature water. (The jar pictured holds 1 liter.) Set the bottle in a sunny windowsill or outside in a sunny spot. In a few hours the tea will brew and be ready to drink! Give the tea sachet a good squeeze to make sure you get all the flavor out. It can then be discarded or placed in a compost bin. 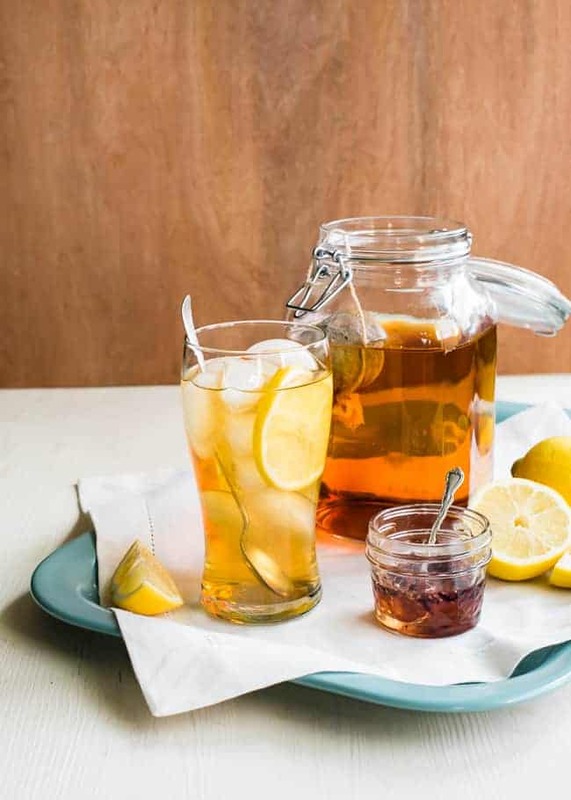 I love my iced tea with a good squeeze of lemon and little drizzle of honey. I think I’m going to be making this once a week! It’s easy and delicious. You can use any kind of tea bags you like – green tea is another great one to try out. A simple way to make herbal tea using the sun's rays to brew it. 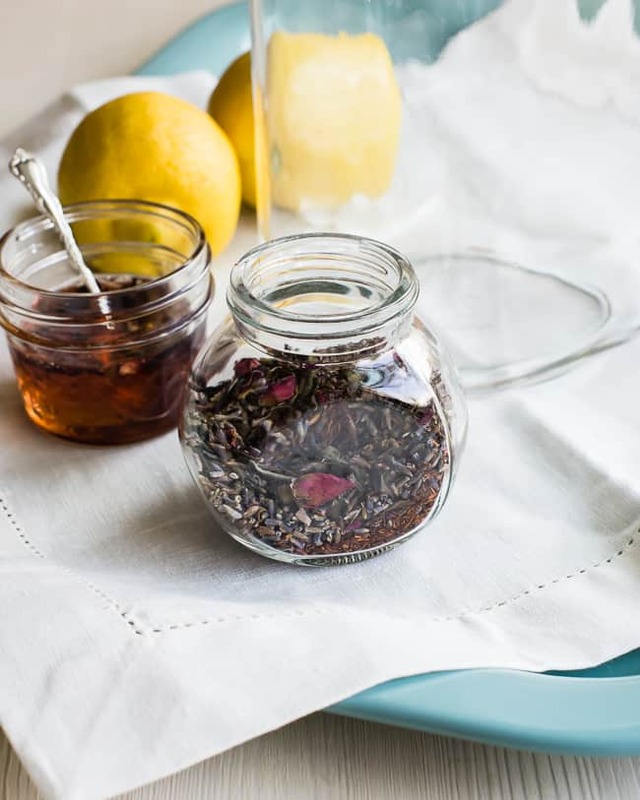 Place rooibos and lavender in a large glass jar and fill with water. Place in a sunny window for several hours to brew. Sweeten with honey and add a squeeze of lemon juice.